Starting a project like this is easy with MetalsCut4U. We need your company logo or sign as a drawing. Preferable as a CAD drawing but a pdf or eps file will also do. Based on the sheet metal you choose and the thickness and measurements you would like we will give you a free quote. If you agree to the cost, we will then start and go to work. A pdf proof file can and will be send to you for your final approval. Then we will cut the sheet metal sign to the shape you desire. 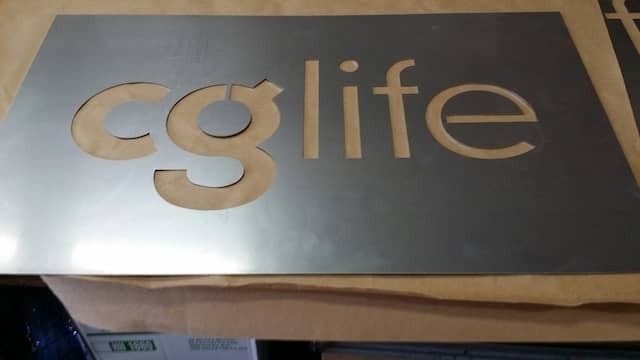 In this particular case the customer wanted the company name to be cut out of a larger mild steel rectangle. But you also can have just the letters themselves. This is totally up to you. What is also totally up to you is the choice of sheet metal, surface and thickness of the logo you would like to have fabricated. Our lead time is short. Once you have approved the final laser cutting file we only need a few more days and your company logo is on its way to you.